"Siddhartha had one single goal - to become empty, to become empty of thirst, desire, dreams, pleasure and sorrow - to let the self die. No longer to be self, to experience the peace of an emptied heart, to experience pure thought - that was his goal. When all the self was conquered and dead, when all passions and desires were silent, then the last must awaken, the innermost of being that is no longer self - the great secret." (At page 21 now)- An ideal student Siddhartha (not one lost like me) but an essentially discontented one (just like me) goes out to discover the great secret- to conquer self and discover the innermost being, the aatma, that is no longer self- detached from pain, need, desire, anything human (perhaps!). He becomes a Samana and finds that the path he is following will never converge to his goal. (happens all the time, isn't it?) His ardent friend, Govinda, on whose mediocrity of thought was he quite sure of, surprises him. 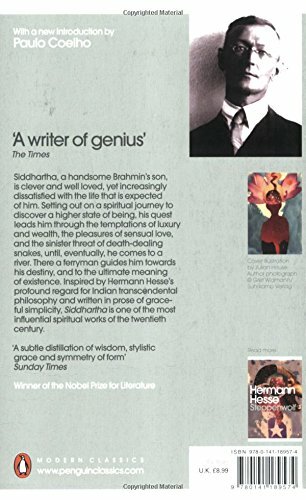 Siddhartha overpowers his own guru by the virtues taught by that experienced man - (basically hypnotising- the idea doesn't rhyme with me) and then the seeker and his follower go forth on a path which the seeker thinks is a way no new hope will come but the follower is eager in pursuing. They try to find what everybody is talking of. Will they find Gautama? And what will happen when they do? I had read this book almost a year ago. To be honest, it did not resonate with me that much. So much talk about nirvana, the goal, aatma! I am an Indian. I grew up with these ideas from both Hinduism, Buddhism as well as different interpretations from a Muslim or a Christian point of view. They, when spoken so much about, almost seem redundant. I had heard so much about this book, especially from non-Indian readers in Goodreads that I was really disappointed while reading it. Too much of philosophical talks sometimes seem futile. After almost 67 years after it was written, the end is the predictable. I felt a little annoyed by the protagonist of this book. I am sorry if it sounds judgemental, but this book is a perfect stereotypical viewof a western mindset's amusement and excitement with the "aatma" ideologies of the eastern subcontinent. Some of the paragraphs stand out independently, which adds to the value of the book a lot. But the stiched into the story, the first half of the narrative seems superfluous. The writer ponders on and onn and onnn, and unlike Henry James' it made me a little impatient. The ideas are deep, very philosophical in nature but with a protagonist who is lost. It seems he is trying to be lost in his quest. His logic sometimes is crisp and intelligent and sometimes "uh!". I really don't identify with him many-a-times. He sometimes seems too full of himself to appreaciate the simplicity of a situation. Flesh is flesh, blood is blood- so why beat about the bush and not accept? He takes the twisted path even when the straight path stares right him in the face. Why? True, we do that in life many-a-times but again the instances used to exemplify that seems a bit overstretched. May be all of this is because there is a gap of half a century's shift in ideologies of the writer and me. Too much of spirituality is perhaps lost on a physics student. But there are a few things I also love about the character SiddharthaHe is fearless to ask. His confidence (sometimes overconfidence, maybe) is appreciable. He dares to take a path which no one has ever taken. He dares to challenge the unchallengable, and he finds his own way. 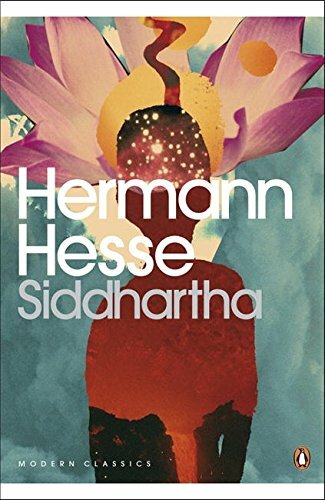 Those who find wisdom in this book probably look for their appearance as the novel enters its second half - the life of Siddhartha as a ferryman. He learns the same things, the same truth which somehow seems to be staring into his face from a long time and which he refused to identify or mistook for something else. But maybe that final "enlightment" and acceptance has something to do with age and finding what he couldn't before and which he almost forgot about. Now, I am sounding too vague! If this book is kind of a coming-of-age story of a soul, it is maybe a little sad from my perspective. I realte to Sid ( :P ) more when he is older, little bit calmer, and I appreciate that even when he forgot who he was, deep down he never gave up. Concluding, it was a very different book. Made me wonder and appreciate and roll my eyes at the same but different moments, but I am glad that I read it. Perhaps, you should too. I kind of pushed my comfort zone with it, and gained a little uncomfortable reading experience which I think for some reason is a good thing. I perhaps would have loved this narrative, if this were a short story and not a novel. It is not as crisp as I want it to be, but who cares! Who knows, maybe half a century from now I will find it perfectly plausible.